Okay seriously, you need to stop paying $50 a bulb for Philips Hue smart lights. They’re terrific, don’t get us wrong, but there are options out there that are just as good but cost way less. 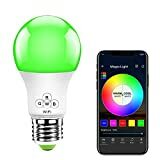 Among our current favorites are the MagicLight WiFi Smart Light Bulbs, which do everything a Philips Hue smart LED bulb can do at a fraction of a price. Right now they’re just $17 each on Amazon, so you can get three of them for the price of one comparable bulb from Philips Hue!